Gmail was launched on April 1, 2004 by Google.It was considered as April fool prank by Google by most of the people due to the date it was launched. However, Gmail was for real and it went on to become a huge success for Google. In starting, Gmail is open to users by invitation only. In fact, I received a Gmail invite from my friend too. The invite only access to Gmail was later on dropped in 2007. 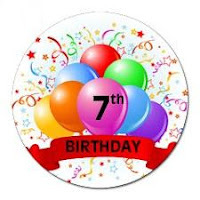 Currently Gmail has approximately 200 million users and is one of the most popular email service after Windows Live Hotmail and Yahoo.Today is Gmail’s celebrates it’s 7th birthday and is better than ever before. There have been so many new features rolled out to users using Gmail Labs and more.